SAGITA COM - TrueSpace adalah perangkat lunak pemodelan 3d untuk membuat model, objek fotorealistik, dan lanskap. Ada banyak tutorial komprehensif gratis dan video untuk menguasai software ini di website Calgari. 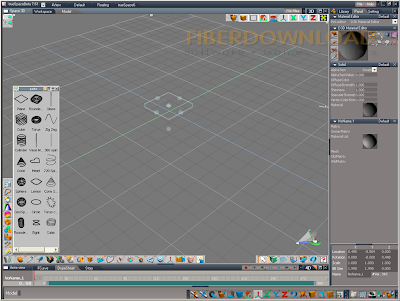 * Modeling tools for making it easy for to create 3D objects and scenes. * Booleans trueSpace is able to handle complex set-ups and still provide you with full control to adjust the boolean after it is applied to get exactly the result you are after. * Work in real-time giving you the best possible modeling environment, and the ability to render an image in seconds rather than hours, or an animation in minutes rather than days. * Improved UV Editor When the time comes to add color and detail to your model, trueSpace gives you what you need through a re-written UV Editor. This lets you lay out the different areas on your model that need different textures, and then export that map to a 2D editor so that you can draw and create the textures needed. * Behavioral animations objects in trueSpace can be given behaviors and animations using the in-built scripting capabilities. The behaviors are encapsulated with the object itself rather than stored externally, making the objects self-contained - if you copy it, you copy the behaviors too. * Characters trueSpace7.6 features easy-to-use skeletons that will let you bring your characters to life. Apply pre-recorded BVH animations from motion capture for the ultimate in realism, use pre-made skeletons to animate your characters, or build your own skeletons thanks to tools that are easy for anyone to learn. With IK Handles, the ability to add or change limbs, and the ability to create and blend clips, trueSpace7.6 makes it possible for anyone from beginner to master to animate their characters. * Morphs let you point edit your mesh and store the results as a named morph, then allow you to blend between all those stored morphs with an easy to use slider panel. This can be used to create facial expressions, for example, storing a smile, frown, laugh, eyebrow movements and more, which you can then mix and match to get the required expression for your character. * Real time cloth for your real-time scenes, you can now add cloth, which will deform with the real-time physics. The cloth will react to user input via the Physics Move tool, or with other objects in the scene, both being pushed by them, and pushing them.